Day 12: This post really has nothing to do with Camp. I live in a nice spot in bush with lots of native birds and small animals around the place. I own cats, but because I'm a responsible cat owner they have a combination of indoors and an outdoor secure run as their territory. In recent weeks there's been another cat around the property - a little tabby. I thought she was feral, so plans to trap her and integrate her into my 'pack' weren't progressing too quickly. She was eating cat food and hanging around near the outdoor run, so I was wondering if maybe she could be tricked into going into the cat run on her own. Apparently the answer to that was "yes". Tonight there was some damage to the wire near the door and it looked like one of the cats might have escaped. There was nobody missing. Instead, sitting there like she'd lived with them all her life, was the tabby kitten. Who isn't as feral as I might have expected, either. She's more timid than the others, but I was able to pick her up and check her gender and her teeth. Definitely a female, less than six months old... and sufficiently okay about humans to stay sitting on my knee after the examination. I've revised my opinion of her origin from 'feral' to 'unwanted pet dumped in the bush'. She'll have a good home here, at least. Anyway, her name is going to be Gypsy. I would have taken a photo of her, but I didn't have a camera on me at 11:30 at night. I'll see if I can get one some time tomorrow. Anyone know a good way of photographing a shy kitten without just ending up with a super-closeup of another cat's nose? Oh... 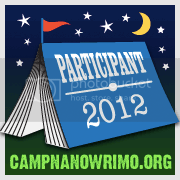 I'm supposed to talk about Camp NaNoWriMo? Well, I reached 25k and gave my main character his first life-threatening injury, courtesy of the girl he loves. That should do for an update. Now I can go and figure out how to photograph the kitten in the morning.